What a treat it was last night to see the first episode from April 1963, with John Beradino, Emily McLaughlin and Roy Thinnes. The black and white half hour was gripping and well done with all the theatrical craft that characterized intense, intimate early TV drama. Leap ahead to the Gloria Monty renaissance. How thrilling it is to see old friends again. Lesley, Rick, Monica and Alan! Slick and Ruby! Dan Rooney! Even Emma Lutz! Wait a minute … there’s Susan Moore! How fast and funny was the young Tony Geary was, and how ever so beautiful the 19-year-old Genie was. I also just saw an episode with young Robin, Jason, Brenda and Lucky … Thankfully, Moose is back from an emergency run to the market with a fresh supply of tissue. So far, I’ve relished just four episodes. By the time you read this, I will have watched the remaining 46. Did you watch the marathon, too? What were your favorite episodes/moments? In the marathon or in GH ever. Do write and tell us. My favorite moment ever was Luke and Laura dancing to “Fascination” in Wyndham’s — the essence of romance, what we all dream about. My favorite episode was the magnificent one in which Maxie received B.J.’s heart — absolute dramatic excellence. Surely no one ever cried harder that I did during this episode — in all of television history! Against all odds, GH is still here! This week leading up to the actual anniversary has been a study in mounting excitement. Lucy and company rehearsing the Nurse’s Ball was great fun, and of course Richard Simmons was beyond silly. I remember exercising with him at the Campus Disco in the late 70s and early 80s. Wasn’t it great that Richard and Lucy had an argument over the music for the opening number … and it turned out to be the 80s hit “General Hospi-Tale” by the Afternoon Delights? Imagine moi falling for Liz and AJ as a couple. I’ve never been a huge Liz fan, but the characters really are ideally matched. Each has overcome so much in his/her life. They are destined for a mature adult relationship. And Sean Kanan has been just truly excellent since his return. Wait a minute, isn’t Ellie the only woman in daytime history who doesn’t want to have a baby? Because of, she argues, the pitiful state of the world today, with its relentlessly deteriorating environment. I respect her choice. And finally, I’m so glad the writers seem to have strengthened Laura a bit this week. (See last week’s column.) I loved when Laura slapped Luke when he put the adrenaline into Nicholas’ IV. But it bothered me that Laura has only become assertive when her children (Lulu and Nicholas) were threatened. Will she continue to become the wise, intelligent woman we have always known her to be? May General Hospital enjoy 50 more years. And, as the celebration continues, so will Marlena’s musings … and, hopefully, yours, too. Keep tuning in! Camera pans to a second sign that at first seems to be that of an Actors Studio Home with the classic frozen masks of comedy and tragedy. Camera zeros on the words “cryogenics wing” and the unusually puffy lips of the masks turn out to be the actual frozen faces of the first two customers, Monica Quartermain and Bobbie Spencer. Luke and Scottie pause glare at each other and simultaneously declare, “Never” and begin to fight—brief sequences of clashing wheelchairs (in the tradition of Murderball) pans to Laura with her hand to her mouth….to a matrix style CGI produced airborne wheelchairs heading toward each other…and Laura wringing her hands….an explosive clash and the men lie flung from their wheelchairs, grasping each other’s hair, writhing on the floor in front of the horror stricken Laura. Scott and Luke continue to argue but their voices merge as they both sneer “love of his life.” They pause, startled by having spoken in unison then resume arguing to merge again on “it’s not like you were ever able to be faithful to her…” and they again pause, look at each other first knowingly then ardently and the hair grasps melt into caresses and they passionately kiss. Marlena says Marvelous! Fabulous! LOLOL! Thank you so much for writing this and sending it to me. 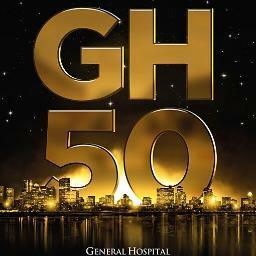 Happy 50th Anniversary General Hospital! !